The second most populated town on the island, Sant Antonio de Portmany (also known as Sant Antoni or San Antonio) is the main hub of leisure and entertainment that Ibiza is well known for. For second home buyers, San Antonio de Portmany property is appealing for many reasons. Especially attractive are residential areas in San Antonio Bay in the south, while in the north part with the beautiful promenade extends all along the way to the centre of the town. Compared to the whole province of Ibiza, San Antonio de Portmany property prices are significantly lower. An average price for an apartment is currently Average price per sqm. in Sant Antoni de Portmany €3,421 0% properties#: 76 last change on: 23 Apr 2019 €3,421 per square meter, while for a house it is around Average price per sqm. in Sant Antoni de Portmany €3,883 0% properties#: 59 last change on: 23 Apr 2019 €3,883 . For investment, the average price per square meter is Average price per sqm. in Sant Antoni de Portmany €6,338 0% properties#: 25 last change on: 23 Apr 2019 €6,338 . San Antonio de Portmany property market offers many of villas and penthouses boasting fantastic sunsets and stunning views of the Bay and the harbour. There is a premium value for houses and apartments with a privileged sea view position. 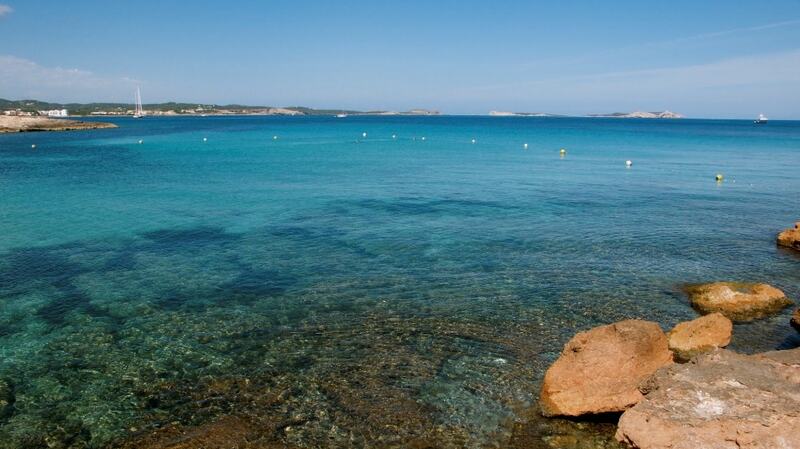 The most active agencies on the local real estate market are Ibiza Property Shop, Everything Ibiza and VIS Ibiza. Why San Antonio de Portmany property? The inhabitants used to live from farming and fishing, following ancient traditions. During the 1980s the town has undergone a tourism boom as large numbers of visitors flocked to this sunny destination. Today, this former fishing village is popular among European holidaymakers offering an array of services. It is mostly visited by British holidaymakers, as well as German, Italian, Dutch and Scandinavian internationals. Whether you’re in search of a quiet spot to enjoy the sunset in a romantic ambience or a bustling show with live music and dancing, you’ll discover many choices at the town’s promenade, the harbour area and in the small side streets. During the high season months, from July to the beginning of September, the area is full with the buzzing nightlife. The shops, bars and beaches are alive with activity mostly in the summer and nearly left behind in the winter. 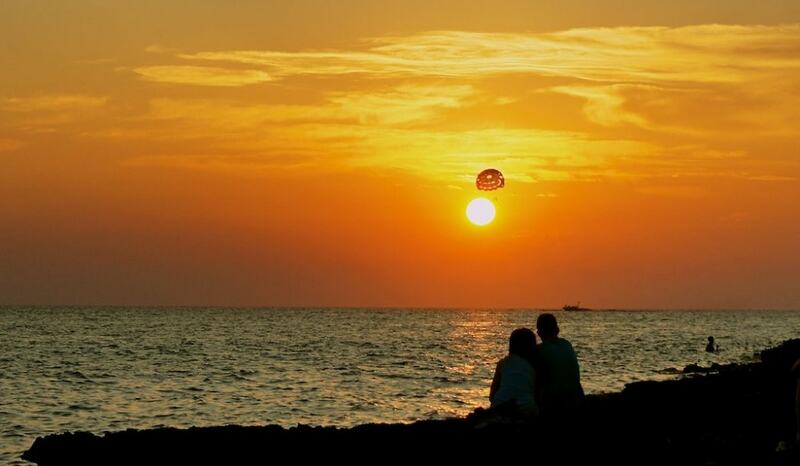 Therefore, this time of the year is preferable for those visitors and residents, who prefer the quieter parts of Ibiza. At the entry to the town, you see the best-known landmark of Sant Antoni. 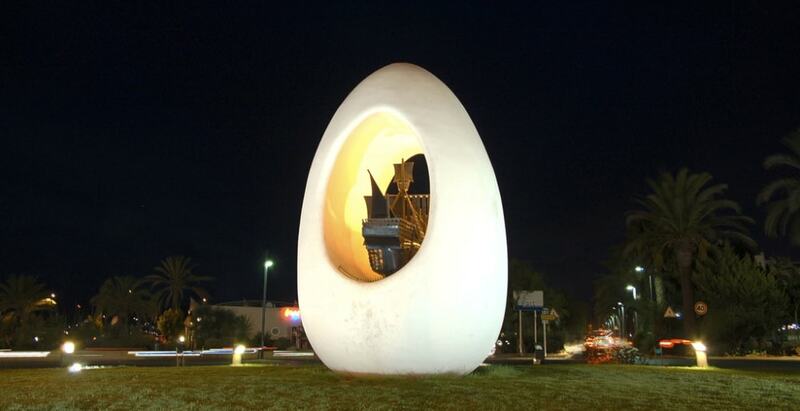 This is the statue in the shape of an egg, which was inaugurated in the early nineties to honour the local belief that this was the birthplace of Christopher Columbus. Among other notable sites, San Antonio’s fourteenth-century parish Church takes the attention beyond the modern properties. 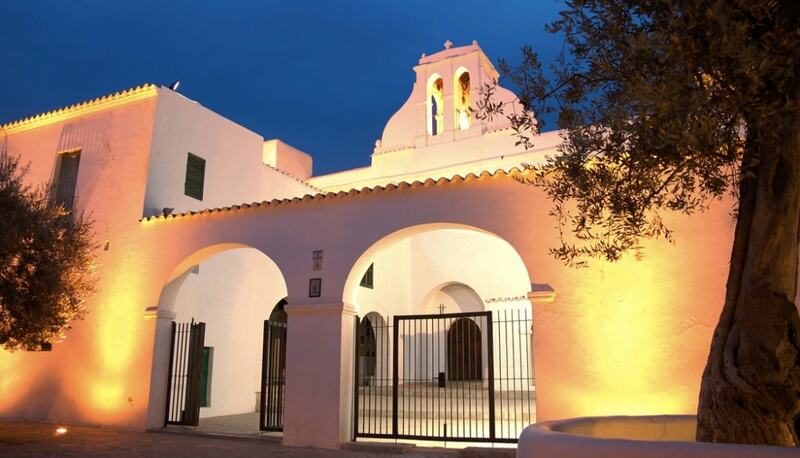 It is an excellent example of an ancient fortified church that provides a glimpse into Ibizan history and culture. There is a craft hippy market set up behind the Church, which is held from May to October. 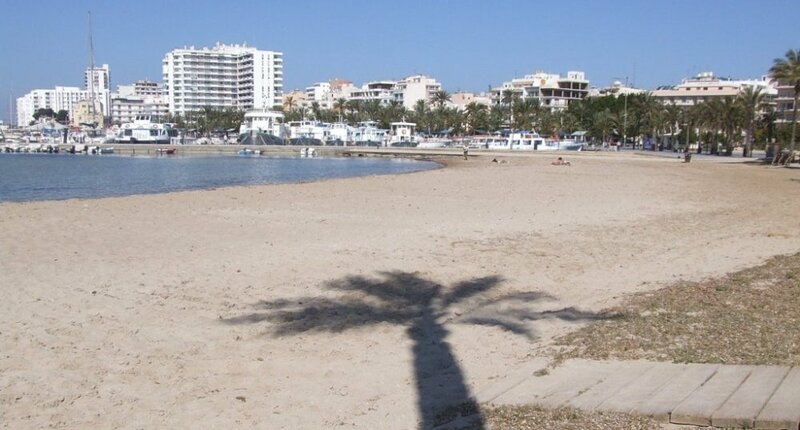 Right by the sea is the Passeig de ses Fonts that along with the coastal promenade comprises Sant Antoni’s centre. It is beautifully surrounded by many plants, including palm trees, and has massive fountains illuminated by night. Across the square, you find a host of pavement cafes and restaurants offering the sea view. In the summertime, many outdoor concerts take place at its terraces. Just beneath the promenade is San Antonio Beach. It is the epicentre of daytime activity and is extremely busy during the summertime. However, the water is clean and shallow, which makes is great especially for families with children. During the day, the scene includes mainly sunbathers sipping cocktails in the sand and listening to the music from the lively spots or lying motionless attempting to retrieve from the prior night’s celebrations. Those who still have some energy will find a lot of surfside sports to entertain themselves. If you are searching for something more private, days can be spent chilling out and relaxing on the more quiet beaches found all over the coastline. Here you will find a nice sheltered cove at the north side of Cala Gració, and a scattering of other small calas such as Cala Salada, Calo des Moro, Cala Llosar, Cala Gracioneta, and Punta Galera. The beach of San Antonio extends to the natural harbour filled with speed boats, ferries and yachts. Here you find a selection of water sports, fascinating boat trips, and commercial nautical activities. 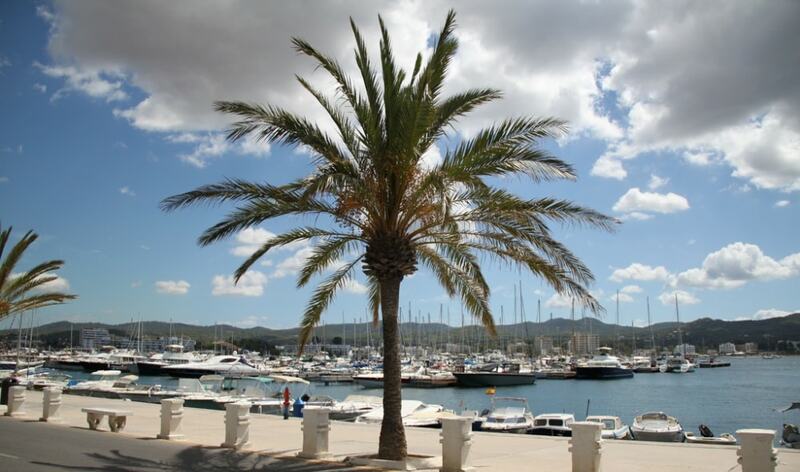 The yachting marina of the Club Nàutic Sant Antoni warmly welcomes the town’s visitors. It features 250 berths for accommodating yachts up to 50 metres in length and offers a complete range of high-level nautical services. It has a very convenient location, with the centre just a few minutes away on foot. When dusk falls, the resort moves up a gear into true party mode. The nightlife venues start to open up for the next big rowdy night, and the frantic crowd comes down on the strip searching for the rowdiest party in town. 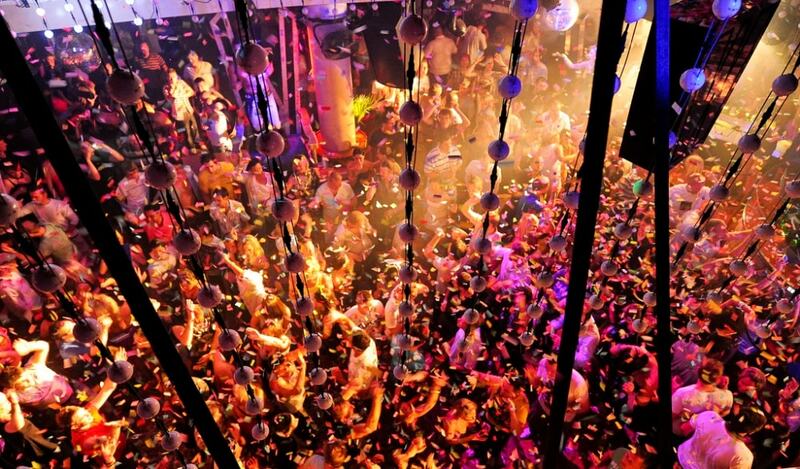 San Antonio hosts a number of widely recognized big nightclubs, with the most famous being Eden and Es Paradis. The latter is well-known for its exclusive Romanesque decoration and water parties. The popular area of San Antonio that is known as West End is the hub of all the fun. Only a couple streets wide, it is an extended strip of neon flashing bars, pulsating nightclubs, lounges, take-away cafes and restaurants. This partying center ensures to keep any night bird going until dawn and further. Along the coast in the west is the Sunset Strip that also features a huge selection of splendid sunset bars and clubs, including the legendary Cafe de Mar. 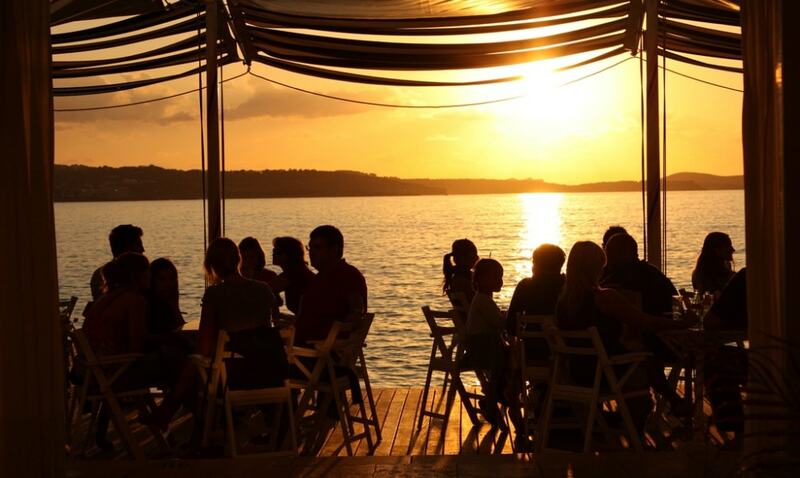 This area provides an ideal setting to enjoy a glass or two with the spectacular sea view. A large number of partygoers from all nationalities also gather here together to watch the sunset accompanied by the live music and DJ’s. Truly, the west facing San Antonio has the best sunsets on the island. In terms of the gastronomic offer, San Antoni has something for everyone. Here you find everything from Mexican-themed dining treats at Tijuana to exquisite cuisine in the elegant outdoor seating of Villa Mercedes. The annual festivals in the town include Fiesta of Sant Bartolome held on August 24 with the spectacular fireworks display and San Antonio Fiesta on January 17. Whenever you are fancy getting out and about, you can head for the traditional village of San Rafael nearby. 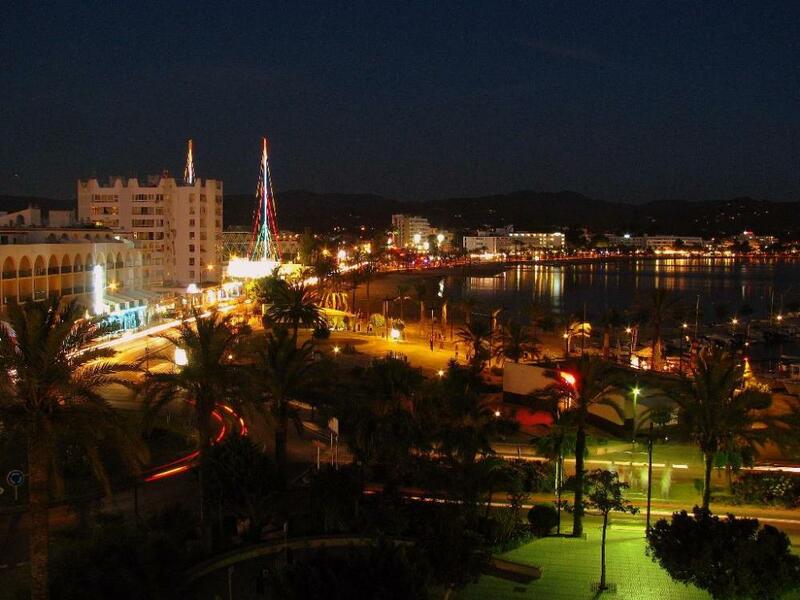 Ibiza Town with its amazing shopping, lively waterfront and the charming old quarter is just a twenty minute drive away. With its great selection of properties and entertainment, San Antonio de Portmany property market offers something for everyone. No doubt, it is an excellent holiday and second home choice.